Features - Soft touch headband and ear pads - Adjustable headband and volume limitation - Comfortable wear and no harm to kids’ ears - Bring enjoyable listening experience - Stimulate musical potential and intelligence Specifications - Driver diameter: 30 mm - Frequency response: 20-20KHz - Speaker impedance: 16phms /- 15% - Sensitivity: 80 /- 4dB - Plug: 3.5mm gold plated - Cord length: 1.2m /-15% Package Contents 1 x iClever Kid Headphone 1 x Warranty Card. LED Light Up Cat Ear Headphones Earphone Glowing USA SELLER FAST FREE SHIPPING! 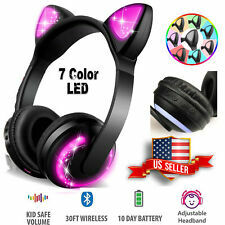 Description： [Adorable Cat Ears]: One of a kind headphones with super adorable glowing cat ears. Stand out while you rock out with cat ears that set you apart from the crowd. [Stunning Lights]: Four different light modes will have you outshining everyone. Seamless switching between modes lets you tailor your look to your mood effortlessly. [Comfy Portable Design]: Cushy ear pads keep your ears comfortable no matter how long you listen, while the foldable, compact design fits perfectly in your bag or backpack. [Wireless Freedom]: Bluetooth 4.2 provides the ultimate wireless experience while,enabling completely unrestrained listening across multiple platforms, be it smartphones, PCs, or game consoles. [Long-lasting Battery Life]: Enj. Tangle free wireless bluetooth conntection. Love anything cat-styled and the fancy LED lights, but don't want to settle with cheap and boring looks?. 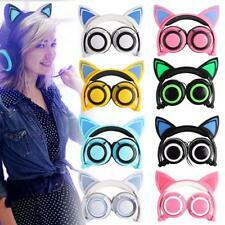 Take no further look but this lovely Cat Ear Headphone and enjoy the fun with your favorite music now! Type:Foldable Flashing Glowing Headphone. 1 x Cat Ear Headphone. Excellent sound quality and super clear sound. Fold Size:21.5 19 7.5cm. Cute earphone, very good design. Model:Gaming Headset Earphone. PROTECTIVE CASE, HEADPHONE WIRE, CHARGING CABLE, MICROPHONE INCLUDED. WITHOUT BOX. Comfortable Wear: Soft touch headband and ear pads cater for your tender children, getting away from pressure on head and ears. - Soft touch headband and ear pads. Safe for Kids: Made of safe, non-toxic materials, this kid-friendly portable headset is durable enough to withstand abuses, worry-free from any stretches or twists. Bluetooth Headphone Over Ear HiFi Stereo Wireless Headset Foldable sport headset. Kids Bluetooth Headphone Wireless Over Ear Foldable Stereo Sound Headset LED cat. Bluetooth Headphone Wireless Over Ear Foldable Stereo CAR EAR Headset LED TOP. Trending at $60.96eBay determines this price through a machine learned model of the product's sale prices within the last 90 days. Blue Polaroid Light-Up Cat Ear Headphones. Condition is New. Shipped with USPS First Class Package. 20KHz frequency response32 Ohm impedance40mm drivers Cat Ear Speaker Audio 200Hz?. 18KHz frequency response32mm drivers In the box Wireless Cat Ear Headphones4-foot detachable headphone cable (3.5mm)USB recharging cableProtective carry caseAriana Grande Wireless Cat Ear Headphones with Color-Changing Lights. Trending at $128.50eBay determines this price through a machine learned model of the product's sale prices within the last 90 days. LED cat ears lights up. Padded headphone and ear cushions. Lightweight, folding& swivel design. Bluetooth 4.1 Wireless Stereo Headphones Foldable Headset Super Bass Earphones. Wireless Bluetooth Headphones Headset Sport Stereo Universal Foldable Super Bass. Padded headphone and ear cushions. 3 LED model on cat ear (Solid / Fast Flashing/Slow flashing). LED model on side earpad(only work in Bluetooth mode, flashing freely）3. Dynamic sound quality. Compatible with Bluetooth and 3.5mm devices. ). LED cat ears lights up. Communication: Wired. Padded headphone and ear cushions. 2 LED model(Solid / Flashing). LED button battery: 3V 210mAh. Earphone 1. Max input power: 50mW. Rate power: 20mW. Padded headphone and ear cushions. Earphone 1. US Wireless Bluetooth Headphone Flip Speaker Hifi Headset Loudspeaker 2 In 1 NEW. Lightweight, folding& swivel design. Sensitivity: 102dB. With Microphone: No. Brookstone (WIRED) Cat Ear Headphones with External Speakers, RED. Condition is Used. Shipped with USPS Priority Mail. Never been used pink Barsone Cat Ear Headphones. Practically brand new, just no original packaging. Cat ears light up and flash as well. Tested and work great. OFFICIALLY ENDORSED BY ARIANA GRANDE - Ariana Grande officially endorses these Brookstone headphones which feature her signature on the left earcup. LISTEN IN STYLE - These limited edition Ariana Grande wireless headphones are sure to turn heads wherever you go and make you the envy of all your friends. 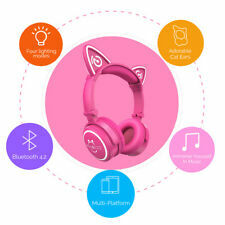 Wireless Bluetooth Cat Ear Headphones Color Changing. Lightly used in very good condition. Comes In original package with zippered hard case hard case and a usb charging cable, no charging block.